It’s not uncommon to find agitated Hindu nationalists lamenting their government’s stance on all the conflicts that Israel finds itself in. Albeit, very little of this love is based on cold hard strategic thinking and most of it is based on emotional anecdotes. “Iseraal halped India when Kargil dood, read histry bro”, they say. So, let’s do just that. We aren’t morally beholden to tow the Israeli line on any policy issue out of gratitude for weapons they sell to us, for which we pay the full price. We are a sovereign nation and do what’s best for us. Besides, Jews aren’t some otherworldly saints who have descended upon humanity to talk about marshmallows and bunnies. The Jews are no less hostile to Dharmics than other Abrahamics. Before we even begin dismantling the security narrative built around Israel being best friend of India(actually Hindus), the bleeding heart Hindus will learn a lot by looking at the famous names of Jews who are bent upon destroying Hinduism from inside. Since they lie at the fountainhead of monotheism, it is no surprise that Jews fill the rank and files of breaking India forces and provide the intellectual armour against Hindu traditions and practices.The Jews believe that they are chosen people and share the same hatred for pagan Hindus like the latter monotheistic derivatives of Christianity and Islam. 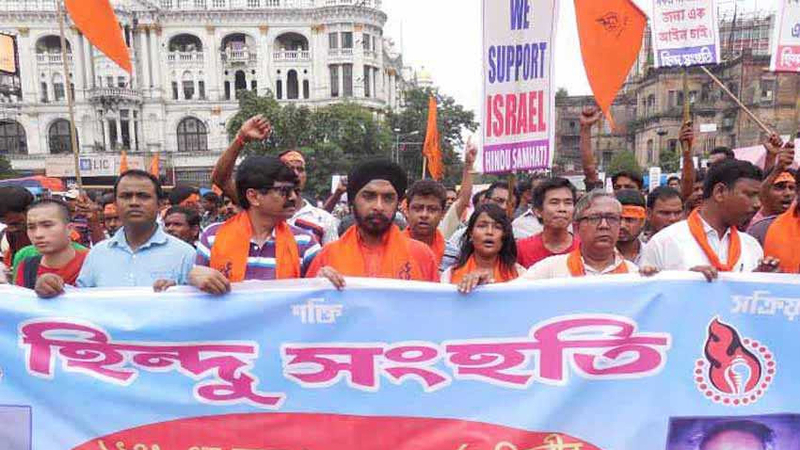 Many Hindu nationalists become very attached to Israel for no reason at all and seem to defend Jews no matter what. They seem to have internalized the propaganda by the leading Jewish sympathisers in India like Subramanian Swamy and other US fanboys as if Jews are eternal friends of Hindus. But is there any evidence to suggest that Jews are friends of Hindus? Any empirical analysis around the subject shows no evidence for the same. In fact, if anything Jews have been as negative to Hindus and India as their Abrahamic cousins – Muslims and Christians. Many Hindus think that since Jews don’t evangelize like the other Abrahamics and because they have suffered under Christians and Muslims just like Hindus, they have an emotional attachment to Jews. This is stupid logic, since by the same logic, British and Mughals fought with each other and hence only a mad man can think that either of them were allies of Hindus. In fact, any unbiased look at evidence of Jewish behaviour against Hindus will show the same negative impact of Jews on Hindus just like their Abrahamic cousins. For instance, almost all of the Hinduphobic Indology, which lays the ideological foundation for most of the Breaking India forces have Jews at their heart. One just has to look at the venom against Hindus and Hinduism spread by Wendy Doninger, Christopher Minkowski, Yigal Bronner or the attempts by Andrey Truschke to white wash the atrocities of Aurangzeb as if it never happened. Imagine the outrage it will cause if a Hindu scholar of Jewish studies released a book saying Hitler never killed Jews and how he is misunderstood. But the point many Hindus miss here is that this is because of the basic polytheism of Hindus vs the monotheism of the Abrahamics, in which Jews lie at the core. Even the Israeli help for our country wasn’t really help but just mutual interest in containing the Islamic enemies which both have and for business reasons and not direct friendship. This is no different than Christian Byzantine empire helping the Islamic forces in Arabia to take out the pagan Persian empire. If not for the existential threat Israel faces from Muslims countries in its neighbourhood, it actually has no reason to befriend India and Hindus other than for business. So it is important for Hindus to drop this unusual and irrational and largely undeserved love they have for Jews and look at the situation from a proper geopolitical perspective and decide objectively the best course of action for Hindus and India. Given this background, now lets try to understand Modi decided to not visit Israel. This is done with great forethought, not out of some Nehruvian idea of a hipster worldview. Modi was scheduled to visit Israel, making him the first Indian PM, but then suddenly India downgraded the level of diplomatic engagement from PM to MEA, now Sushma Swaraj is going. This change was a result of some hard thinking by India’s security cabinet. It is in our interest that Israel remain under some kind of existential threat from other nations, so that India can retain an elevated position of importance in the eyes of Israel. An Israel that is under no pressure has no obligation to play nice with India, and they might as well start blackmailing us with threats of selling weapons technology to Pakistan, like Russia and France does. The fact that Israel remains under siege impedes them from taking any measures that might alienate India. This status quo favours us. Israel needs India because the constantly looming threat of India keeps Pakistan from forging any meaningful military alliance with Israel’s enemy, Turkey. It is this threat that makes Israel less likely to double cross us. If the threat from Turkey didn’t exist, Israel would be blackmailing us right now. It is in our interest that the Palestine conflict keeps boiling with no resolution in sight. We encourage both sides (Israel and OPEC) to indulge in a competitive bidding to stay in the good books of India since India is a big strategic buyer for both of them. We maintain an ambiguous stance on Palestine so that both Israel and OPEC keep offering us their respective strategic resources (weapons and oil) at competitive rates in exchange for our diplomatic support for their respective causes in the international forums. If the Palestine conflict is solved, then Israel has nothing to stop it from playing a wider global role and there is a fear that they might start playing the same game that the US plays with us vis-a-vis weapons sales to Pakistan. Even our so called friend Russia threatened to sell weapons to Pakistan when the recent talks didn’t go as planned and our all weather friend Israel wouldn’t mind even one bit to carry out a false flag terrorist attack in India to ignite a war between India and Pakistan in the hope of selling weapons to India or to keep Pakistan army busy with India while Israel fights a war with Turkey. That is what makes the situation volatile for us. There should be absolutely no doubt that when Israel decides to go to war with Turkey (or Iran), it will try to provoke a war between India and Pakistan to keep Pakistan engaged in a regional war with India and prevent Pakistan from entering a war to support Turkey (or to prevent India from helping Iran). Last time when Israel was attacked by Arab forces, Pakistani pilots were all over Israeli airspace and shooting them down. An Israel under siege is good for India. Therefore it is in our interest to shrewdly keep the Palestine pot boiling by supporting both sides as and when it is expedient upon us. Israeli presence in the Middle East even (especially) with the Palestine turmoil helps our overall security environment. The Palestine issue is a moral flashpoint for Sunni nations like Turkey. If the Palestine issue didn’t exist, Turkey and Israel would have no casus-belli to antagonize each other. If the looming existential threat of a large scale war with Israel didn’t exist, Turkey wouldn’t seek broader military ties with Pakistan and subsequently Israel wouldn’t share military knowhow with India to keep Pakistan tied down. This organic symbiotic relationship makes sure that Israel remains under our fold without having to bribe them or honeytrap them. If the Palestine issue is solved, we lose the favorable status quo and Israel might then start meddling in our affairs to make military sales. They played a devastating role during the LTTE period as well. We can’t guarantee that global security environment wouldn’t deteriorate to those incredible lows again. When that happens, it would be hard to rely exclusively on our economic relationship as a weapons buyer to fend off Israel without having our finger on the Palestine issue. The potential threat of India siding with Turkey on the Palestine issue would amply deter Israel if the security scene in our backyard worsens. For us to be able to exercise that option, the Palestine issue needs to be kept alive. Let the conflict rage, it is the Muslims who are dying in disproportionate numbers anyway. Besides, what real costs do we incur by simply providing moral and diplomatic support? None. This is a cheap investment with very high returns for us. It would be stupid to give up the Palestinian cause for some cheap sense of right wing thrill. Besides, Israel is no saint either. Israel itself has switched loyalties multiple times in the past few decades. Now many people know that Israel used to be good friends with Iran up until the 70’s. They even had a joint weapons development program called Project Flower. Guess what the objectives of the program were? To counter Indian nuclear program. Yes, you heard it right. Israel took Irani oil, money, gave them old weapon and passed details to Iraq/US who later attacked Iran. Iran helps arm Palestine as a payback for Israel backstabbing them for nuclear project. Israel is no saint. It’s not our fight. One also needs to take a look at how Israel’s relations with their other allies have progressed after Israel’s objectives were served. France and Israel were the best of the friends. It is even rumoured (well known) that it was France which supplied nuclear technology and centrifuge technology to Israel in early 60’s and where does Israel-France relation stand today when Israel doesn’t need France any more? Incidentally Israel, France and Britain had made common cause during the Suez Crisis, which was rolled back by US military intervention against the alliance and Israel’s relation with all the involved parties is fraught with distrust and animosity today, including the US. India would face the same fate if we wear our hearts on our sleeve. Israel today is close allies with Saudi Arabia, which as we all know isn’t exactly India’s best buddy. That has never deterred Israel from cultivating deep military and intelligence ties with the Saudi kingdom, without feeling guilty of offending India. But when India allies itself with Iran to look after its own interests, then it offends the Zionists? Say what you may about Arab nations, one cannot deny the fact that India gets upwards of 50 Billion USD in remittances from our expats living there. Not to mention the safety and security of the expats themselves, all ~8 million of them, a confrontation with either the Arab states or Iran is not in India’s best interest and yet, Israel wouldn’t bat an eye lid to draw India into a conflict if it serves their interest. They won’t hesitate from tying up with Pakistan and use their soil to wage a covert war against Iran if their revenues from weapon sales to India take a nose dive. There is also the possibility of a greater Israel-Saudi-Pakistan alliance against Iran, which would isolate India and put all our interests at risk, so one needs to think it through before blindly supporting Israel’s position on Palestine simply to spite Indian Muslims in online debates. The diplomatic support India gives to the already dead Palestinian cause is simply flowery lip service and does not require India to commit any of its resources nor does it cost anything. The dividends that it yields in return, in terms of co-operation from Arab states and Iran alike are massive. So all the bleeding heart Hindus who feel the compulsive obligation to speak up on behalf of Israel in discussions and rename their online profiles into Hindu Zionists should think t̶w̶i̶c̶e̶, or rather just once, before aligning themselves with the star of David. India needs to take strategic decisions in cold blood without any regard for misplaced emotions like “Hindu-Jew Bhai Bhai”.